Employers: Are You Compliant with Federal and State Employee Handout Requirements? Your business is growing, and you need more help to meet the demands. But when it comes to bumping up your resources, is it better to hire employees or use independent contractors? It depends – largely on your business needs, your cash flow and the type of relationship you plan to maintain. Not only do independent contractors (often referred to as freelancers or consultants) function differently than employees in the workplace, they’re also viewed differently by the IRS and other government agencies. Let’s break it down to help you make a more informed – and legally sound – decision. Greater flexibility — Flexibility is a key advantage of using independent contractors. You can contract the exact services you need, when you need them. For example, if you’re seeking someone to build a website or create brochures for prospects, but you won’t need their skills on a permanent basis, it makes sense to hire a web developer or marketing consultant on a per-project basis. More affordable — Although you may pay more per hour for an independent contractor, your overall costs are likely to be less. You don’t have to withhold taxes, pay for unemployment and workers comp insurance or provide healthcare benefits, nor do you have to cover the cost of office space or equipment. Reduced control — It’s right in the name — independent contractors. You can set deadlines for deliverables and provide project guidelines to these workers, but you can’t oversee their day-to-day activity or dictate how they get the work done. They are expected to work autonomously and are free to set their own hours or schedule. Less company loyalty — Most independent contractors work with multiple clients, so you can’t assume they will prioritize your projects (although you can build certain expectations into your contract). And with each new contractor you engage, there will likely be a learning curve. Team-building — Bringing on a full-time employee can be a vital step toward building stronger, more synchronized teams. Plus, you can provide more direction in line with your business goals. Familiarity with the business — In time, an employee will get to know the business, the work to be done and the internal processes. All of these qualities can help ensure your company runs more smoothly and efficiently. Investment in staffing — Working with employees is an investment of time and money. In addition to paying for salary, insurance and equipment, you’ll assume the monetary and non-monetary costs for mentoring, training and managing the employee. 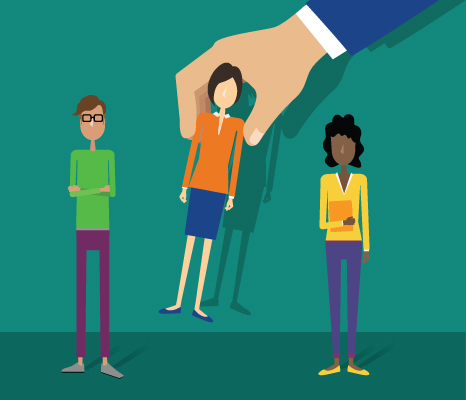 A poor hiring fit — When you make a less-than-desirable hire, you must deal with the drain on your business resources, including the time and effort it takes to terminate them and secure another, better-qualified replacement. If an independent contractor doesn’t pan out, you can simply choose not to work with them again. Once you’ve determined whether an independent contractor or employee is a better choice for your needs, you’ll need to be certain you stay within the lines of the worker relationship. 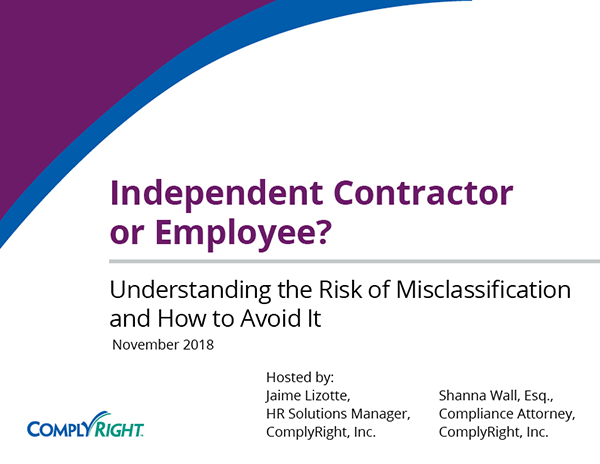 If you improperly classify a worker as an independent contractor, you may be liable for back taxes, wages and penalties and possibly face a lawsuit. For more guidance on how to manage independent contractor relationships, check out the tip sheet, 5 Smart Tips for Managing Your Independent Contractors. One more thing: Whether you hire an employee or work with independent contractors, you’ll be responsible for filing information returns each year. efile4Biz.com takes the hassle out of preparing and filing 1099 forms for contractors and W-2 forms for employees. Just enter your form data online, and this convenient service will print and mail the forms to recipients and e-file the form data directly with the IRS and SSA.